Ban Non Wat (Thailande): early settlements of ithe Khmer civilization. Ban Non Wat, or "Village of the Temple Mound", is a village in central Thailand located near the village of Phimai. The countryside is dotted with villages much like it, and rice fields dominate the landscape, interspersed with groves of trees. A broad range of bird species, from bee-eaters, to hawks, to water birds, inhabit the area. Throughout the area are richly decorated Buddhist temples from which attending monks make their rounds among the villages for alms early in the morning, and during January and February many of the temples host public festivals open to the locals and visiting public. In many ways, it is a typical rural landscape in Thailand. But beneath the surface near Ban Non Wat rest remains of thousands of years of history, much of it long pre-dating the majestic Angkor temple structures and other architectural and artistic marvels of the Khmer Empire (such as that of Angkor Wat) that came to dominate the area and much of Southeast Asia by 900 A.D. 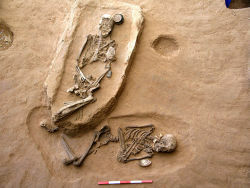 Since 2002, archaeologists have uncovered remains representing a cultural sequence that suggests 11 prehistoric phases. 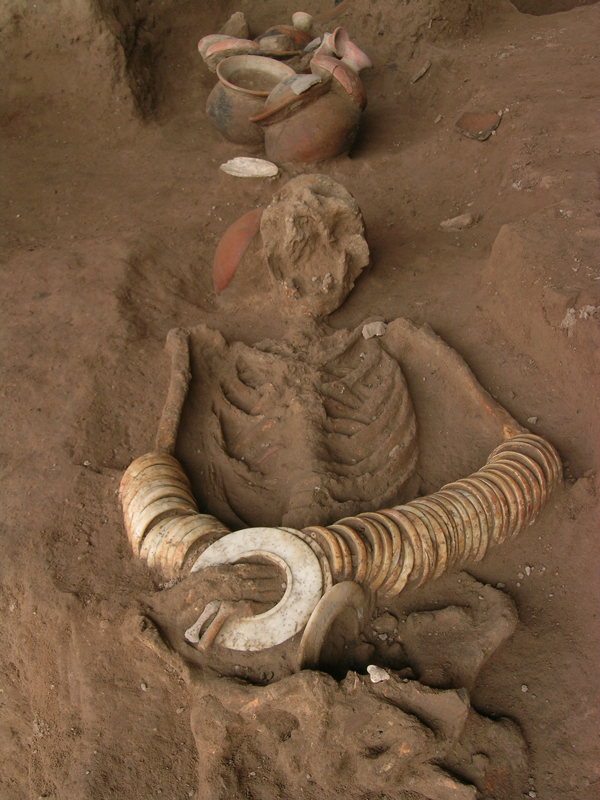 The earliest phases feature flexed human burials of what are thought to be hunter-gatherers, partly contemporary with initial 17th century B.C. Neolithic rice farming settlements that also showed evidence of the raising of pigs, hunting, fishing and shellfish gathering. From this followed a late Neolithic period, six Bronze Age and three Iron Age phases, all dated through radiocarbon treatment and Bayesian analyses. Professor Charles Higham of the University of Otago in New Zealand, the initial excavator of the site, has suggested that the flexed burials - where individuals are positioned on their sides with the legs bent - may represent even earlier hunter-gatherer occupants, and a concentration of animal bone and shellfish has been dated as far back as 15,000 years. As found In more recent stratigraphic layers, graves containing jewelry and tools indicate the introduction of metals in the area between about 3,000 and 3,500 years ago. 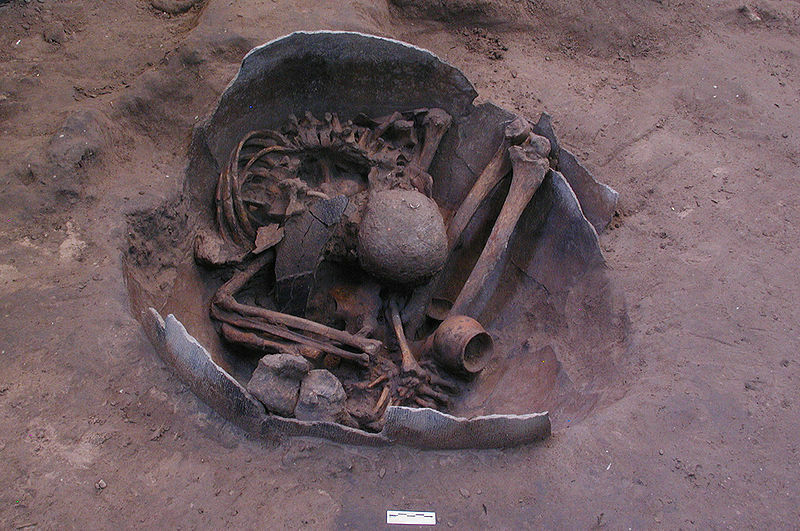 This early Metal Age includes large graves with a rich array of pottery and other grave goods, suggesting a social complexity greater than previously thought. Other notable finds include the discovery of 2,000 year-old well-preserved Iron Age dog burials, including that of a small puppy skeleton discovered in 2009. "It seems that this tradition of dog burials may have continued throughout the prehistoric occupation of Ban Non Wat," writes the key investigators in their report, "indicating that these dogs were important and familiar animals in the community". Excavators found that during the Iron Age exotic ornaments accompanied the dead, including carnelian, agate and glass. In the later Iron Age, the site was surrounded by built-up earthen banks and two moats, directing and controlling water from the nearby river. Evidence of ancient rice fields thousands of years old have also been discovered. The excavations are currently directed by Dr. Nigel Chang of James Cook University, Australia, with support from the Earthwatch institute. Reports Chang, "many of the artifacts recovered have suggested an ongoing link with the Khmer culture, unsurprising given the site's proximity to one end of the Ancient Khmer Highway, at the Phimai Historical Park". Excavations will continue in January, 2013. More information about the excavations and discoveries made at Ban Non Wat, and how interested individuals may participate, can be obtained at the Earthwatch website. Archaeological work has been ongoing at Ban Non Wat since 2002, and has included partners from the University of Otago, the Fine Arts Department of Thailand, Southern Cross University, Kasetsart University and James Cook University. More recently, through a partnership between James Cook University and the Nakhon Ratchasima Rajhabhat University, a number of related community development projects have also been conducted.